Husson’s Cantina has opened its second Las Vegas location. The new location, in the Boca Park Fashion Village in the Summerlin area, offers an indoor dining room, as well as a spacious, outdoor patio. The menu features a wide variety of classic and specialty tacos, such as the kung pao shrimp with creamy garlic chili sauce, cabbage mix and agave roasted peanuts; achiote rib eye with guacamole, radish, pickled chile guero, onions and micro greens; grilled salmon with cucumber and roasted pepper mix, Sriracha aioli and micro greens; and beer-battered portobello, tahini yogurt sauce, kale, habanero rings and Parmesean cheese. Additionally, all of the eatery’s tacos can be served as a salad or rice bowl, and vegan options are available upon request. Hussong’s Cantina is open daily from 11 a.m.-11 p.m. Hussong’s Cantina, Boca Park Fashion Village, 740 S. Rampart Blvd. #7, Las Vegas, NV 89145, 702-778-2160. BRAVO! Cucina Italiana has opened its first location in Nevada, within the new 12,000-square-foot plaza at the Galleria at Sunset mall in Henderson. The upscale classic Italian restaurant features an open kitchen with all cooking done in full view, a large bar area with an inviting fireplace, a private dining room and a spacious outdoor terrace. The menu includes with made-to-order pizzas, grilled steaks, chicken Marsala, classic pasta dishes, a full gluten-free menu and lower-calorie options. BRAVO! Cucina Italiana is part of the Columbus-based BRAVO I BRIO Restaurant Group, and is open daily for lunch and dinner, and brunch on weekends from 11 a.m.-3 p.m. BRAVO! Cucina Italiana, Galleria at Sunset, 1300 W. Sunset Rd. #1950, Henderson, NV 89014, 702-433-4352. Chef Julian Serrano’s Lago by Julian Serrano at Bellagio is now serving lunch daily and offering a three-course prix-fixe menu for $28 or an à la carte menu. The prix-fixe option includes lighter portions of Lago’s small plates and also panini, salads and entrées. In addition, a Sunday brunch from 11 a.m.-2:30 p.m. offers a three-course meal for $38, which includes a basket of fresh baked pastries, choice of antipasti, entrée and dessert. The new brunch replaces the Sunday brunch at Jasmine, which served its final brunch August 30. Lago by Julian Serrano, Bellagio, 3600 Las Vegas Blvd. S., Las Vegas, NV 89109, 702-693-7111. Tacos & Tequila at the Luxor is offering a tailgate menu during NFL football games on Thursdays, Sundays and Mondays. The fare includes the gridiron platter, a selection of game-time snacks including chicken wings, chorizo potato skins, jalapeño poppers and fiesta nachos, priced at $24. Drink specials include buckets of Coors Light beers, priced at $25, and buckets of seven-ounce Sol beers, priced at $18. Tacos & Tequila, Luxor, 3900 Las Vegas Blvd. S. , Las Vegas, NV 89119, 702-262-5225. The Bacchanal Buffet at Caesars Palace is now offering add-on options of whole market-fresh fish, lobster and caviar to its menu that encompasses more than 500 dishes. Whole-fish options include Norwegian mackerel for $21.19 per pound, New Zealand tai snapper for $26.12 per pound or golden pompano for $22.19 per pound, which can be grilled or fried. Whole poached lobster is $150, and includes immediate seating and the choice of a glass of Veuve Clicquot Ponsardin Rosè or Veuve Clicquot Ponsardin Brut. Sasanian Imperial Caviar sells an additional $150, and the "Caviar Dreams" package, priced at $500 for two people, or $650 for four people, includes Sasanian Imperial Caviar and accoutrements, one bottle of Dom Perignon and immediate seating. In addition, all you care to drink packages include unlimited draft beer, house wine or Wycliff Champagne Mimosas available all day for $22 and a Bacchanal souvenir glass. 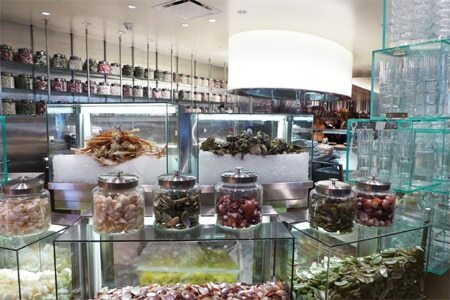 Bacchanal Buffet, Caesars Palace, 3570 Las Vegas Blvd. S., Las Vegas, NV 89109, 702-731-7928. Japanese Cuisine by Omae, helmed by chef Takeshi Omae, no longer serves lunch, and features one table only for two to 10 guests during three evening seatings --- 5:30 p.m., 8 p.m. and 10:30 p.m. --- every night but Sunday. Each guest receives the omakase menu, with dishes selected by chef Omae, priced at $150. The restaurant doesn’t have a liquor license, but guests may bring their own alcoholic beverages, free of charge. Japanese Cuisine by Omae, 3650 S. Decatur Blvd. #26, Las Vegas, NV 89101, 702-966-8080. Yardbird Southern Table & Bar at The Venetian is offering its Summertime Blue Plate Special through August 31 --- two pieces of fried chicken with citrus-pepper watermelon and a biscuit --- for $15. It won’t be found on the menu, and is available by special request only. Yardbird Southern Table & Bar, The Venetian, 3355 Las Vegas Blvd. S., Las Vegas, NV 89109, 702-297-6541. Chef-owner Daniel Boulud of DB Brasserie at The Venetian is showing appreciation to locals by extending a 30 percent discount through September 7 to Nevada residents. Guests need to show a valid Nevada ID to receive the special rate. The discount isn't valid during happy hour, cannot be combined with any other offer or promotion and is valid only for parties of 12 or less. DB Brasserie, The Venetian, 3355 Las Vegas Blvd. S., Las Vegas, NV 89109, 702-430-1235. There are some chef changes at Andiron Steak & Sea and Honey Salt. Chef Brett Uniss has been promoted to the position of executive chef at Andiron Steak & Sea, replacing Joe Zanelli, who moved on to take the executive chef position at Botero at Encore and was an integral part of building the family of restaurants for husband and wife duo chef Kim Canteenwalla and Elizabeth Blau, including the launch of Andiron. Uniss worked his way up the ranks at Honey Salt, having been there since the restaurant’s opening. Chef Michael Van Staden has taken over as executive chef at Honey Salt. Van Staden is from South Africa and is a longtime collaborator and colleague of Canteenwalla and Blau, going all the way back to the days at Simon Kitchen & Bar. Andiron Steak & Sea, Downtown Summerlin, 1720 Festival Plaza Dr., Las Vegas, NV 89135, 702-685-8002. Quite a few chef switcheroos are taking place at Wynn/Encore. Paul Bartolotta will be leaving his namesake Bartolotta Ristorante di Mare in early 2016, and chef Mark LoRusso will relinquish his executive chef position at Encore’s Botero to take his place. Moving over to take LoRusso’s position at Botero will be chef Joseph Zanelli, who was part of the opening team at Wynn and opened Lakeside, and was executive chef at The Country Club before working with Blau and Associates at Honey Salt and Andiron Steak & Sea, where he has been since 2013. Zanelli will serve as executive chef of Botero until November 1, when the restaurant will close and he will then oversee a new concept that will debut in the space. It has not yet been announced if Bartolotta Ristorante di Mare will be changing its name. Wynn Las Vegas, 3131 Las Vegas Blvd. S., Las Vegas, NV 89109, 702-770-7000, 1-888-320-WYNN.